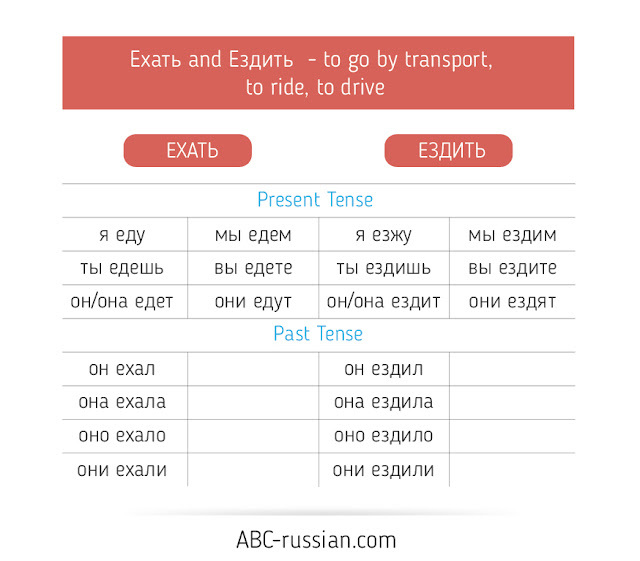 ABC Russian: Russian Verbs of Motion. Download conjugation of all verbs. Russian Verbs of Motion. Download conjugation of all verbs. 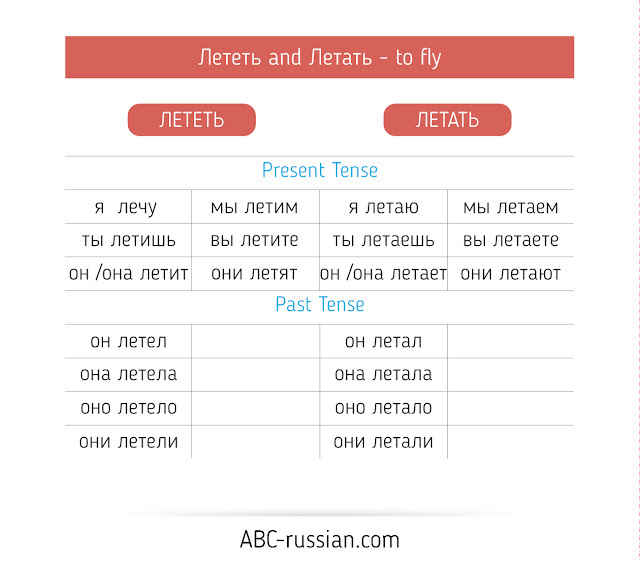 You already know that there is a special category of verbs in Russian language - so called Verbs of motion. The most popular Russian verbs of motion you can find here. You can easily download this table and use it in your studies. You should remember that all Russian verbs of motion go in pairs: unidirectional and multidirectional. How to use different types of these verbs you can find in my post: Russian Verbs of Motion. Part 2 and there you can also easily download the table of it’s usage. Here you will find conjugation of all popular Russian verbs of motion in Present and Past tenses. This verb of motion denotes: to go on foot, to walk. Сейчас я иду в университет. Каждое утро Анна ходит в спортзал. There are lot of idiomatic expressions with this popular Russian verb. 1) Asnwering the question "How are you?" 4) Speaking about life. Life goes on. 6) Speaking about lesson, film, workshop etc.- everything that is in progress now. В кинотеатрах идёт интересный фильм. В январе в Москве пройдёт серия мастер классов по вязанию крючком. Маша ездит на работу на метро. Я боюсь летать на самолёте. Птицы летают высоко в небе. Я бегаю по утрам в парке. This Russian verb of motion usually translated into English as: to drag, to trail, to pull, it denotes to pull somebody/something along with effort and difficulty. Мне пришлось самой тащить эту тяжёлую сумку. Если кто-либо таскает что-либо, то это означает, что этот человек переносит что-либо тяжёлое в руках, на спине и т. д. 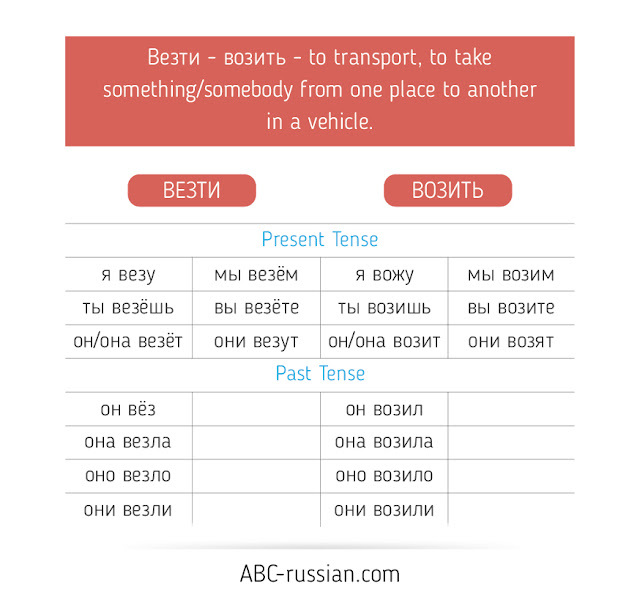 This Russian verb means: to drive, to chase, to run after somebody/something in order to catch them or to force somebody to move in order to go away or to to force somebody to leave a place, position etc. To roll, to drive, to wheel, to turn over and over and move in a particular direction; to make a round object do this. To climb, to penetrate, to reach into, to go into or through something with difficulties. Ночью воры разбили окно и залезли в магазин. Кошка быстро залезла на дерево. To creep, to crowl, to move forward on your hands and knees, with your body close to the ground. To stroll, to wander, to walk slowly around or to a place, often without any particular sense of purpose or direction. Антон долго бродил по улицам. Грибники заблудились и всю ночь бродили по лесу. To carry on foot, to take somebody/something from one place to another. To wear clothes. Я несу книги в библиотеку. Мне не нравится носить шапку. This verb is also transitive, that means it requires noun in Accusative case after it. Дедушка каждый день возит внуков в школу. Завтра машина привезёт новую мебель. Иван пошёл в автошколу чтобы научиться водить машину и получить права. Я давно за рулём и хорошо вожу машину. Родители ведут ребёнка в школу. Я каждый вечер вожу собаку на прогулку в парк. Этот курс ведёт профессор Иванкин. Завтра Мария будет вести занятия для старших классов. Дети, которые хорошо себя ведут, обычно получают более высокие оценки. 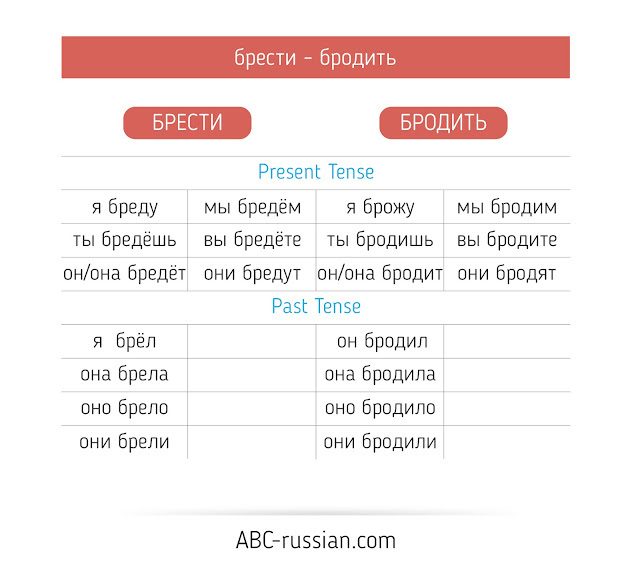 Это целое искусство - знать как себя вести в высшем обществе. You can download and use all these tables in My Cloud absolutely free. 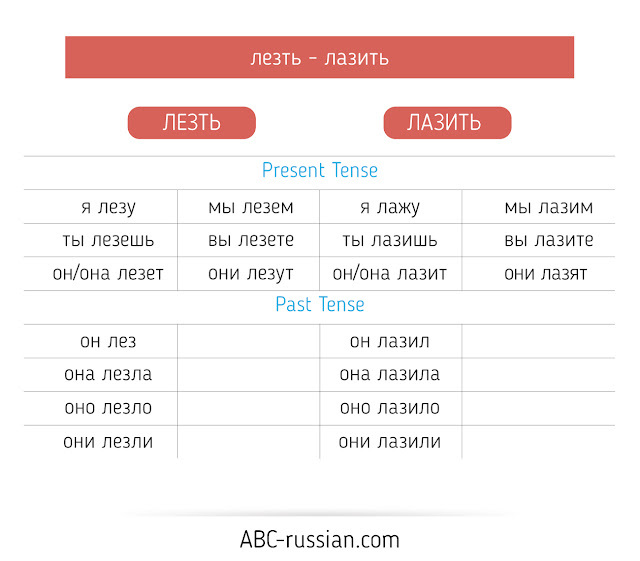 I hope that help you to make Russian language and Russian verbs easier. Feel free to leave comments in the comment box. Thank you. Спасибо!